Michael Allen Smith, the publisher of INeedCoffee.com provided a great opportunity to share how I created my 2008 Sketchtoon Coffee Calendar, in the February 2008 issue of INeedCoffee. 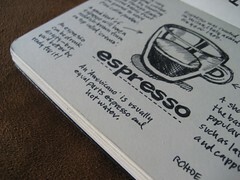 In the article, I share details of my inspiration, how I researched coffee drinks and the process of sketching, scanning and production to create the 2008 Sketchoon Coffee Calendar. A few years ago, my wife and I went looking for coffee-themed calendars to be used as gifts for coffee-loving friends. We were very surprised to find none in the calendar kiosks at the local malls or at coffee shops and very few to choose from online. Being creative people, we decided to create our own calendar, using Cafe Press to print them. Our first calendar used black and white photos and was received very well by our 2 friends. About the same time, I'd been working on a drawing style I had created called Sketchtoons where I mixed loose sketches with hand-written notes in my Moleskine sketchbook. I decided to do a new calendar, creating sketchtoons for 12 coffee drinks. In this article, I'll document how I came up with the ideas, drew, scanned and colorized them for use in calendars and other items, and then marketed and sold the calendar with no budget. I invite you to read the entire article: Creating the 2008 Sketchtoon Coffee Calendar and check out the excellent coffee resources on INeedCoffee.com. Even better: get in touch with Michael and submit your articles, reviews, and artwork for potential publication in a future monthly issue of the INeedCoffee Newsletter. Mike,I recently bought this calendar and it is every bit as good as the pictures present them. I LOVE IT!!! You do some phenomenal work, I've enjoyed browsing through your flickr galleries. Have you trademarked the term "Sketchtoon"? Mark, thanks! I'm super happy to hear you are enjoying the calendar � you made my day. Thanks for your kind words on my work too!